So it is no surprise that Delhi leads the country in urban change. CNG-powered public transport, stricter emissions regulations, better buses, wider roads and new parking lots, cartoonishly big investments in a metro, expensive sports facilities, heritage-conscious cleanups of Connaught Place and other parts, endless exurbs full of empty flats, malls, malls, malls — all these landmarks of contemporary Indian urbanism either began or attained scale or visibility here. What Delhi wants, therefore, is worth watching. 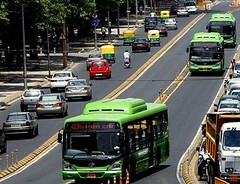 Right now, Delhi appears to want to get rid of the Bus Rapid Transit (BRT) corridor. This is a 5 km stretch of major road between central and south Delhi that has been divided up between different classes of traffic: two lanes for buses, four for cars and motorbikes, two for cycles. There are more cars and bikes than buses, though more people travel by bus and bicycle than by private vehicle. By people numbers, then, the new road division is not unfair. As far as traffic flow goes, BRT is more or less disastrous. Unless they have no choice, private motorists do their best to avoid the BRT corridor. The Delhi government was planning to extend BRT to other major arteries. But a recent study by the Central Road Research Institute says the BRT is inefficient at moving traffic, and wasteful of time and fuel. Meanwhile a court has ordered traffic authorities to open all lanes to traffic pending a final decision on the BRT corridor. It could well happen that BRT is struck down. People in cars will be happy. People in buses and on cycles don’t matter. Lefties will moan in the op-eds, but they don’t matter either — in fact, the city pages of the same papers will probably mark BRT’s demise with more positive coverage. Oh well. A couple of important points to note. (1) BRT was so halfheartedly executed, and so limited in scope (just 5 km on one route over half a dozen years) that it was never going to achieve much. And (2) it would never have worked in Delhi anyway, because we Delhiites are terrible at putting our fellow citizens, or indeed a civic ideal, first. For example: right from the start Delhi’s lawbreaking bikers took over the BRT corridor’s cycle lanes, and cars (especially government cars) bullied their way into the bus lanes. Pedestrians crossed wherever they wished to; it didn’t help that they had to cross the car lanes to get to the bus stops. At first the traffic police tried to fight all these (totally predictable) misuses with massive deployment. Naturally they could not keep it up. Delhi’s citizenry is, of course, unusually useless at rubbing along together. Despite all the money and effort that the city government is expending on creating supposedly public and class-blind facilities, among which BRT, the new buses and the Metro are three big ones, the effect in this city will be to entrench rather than erode differences. What’s more, if other Indian cities wish to emulate Delhi by investing in similar systems — and they’re doing it already, from Jaipur to Chennai and lots of places in between — they should expect a similar result: a social Delhi-isation. Invest in roads, there will be more cars. More cars means more atomised travel, more class separation. To balance the car, invest in buses and Metro (the Centre will pay part of the cost anyway). Bus and Metro will cannibalise pre-existing/ad hoc cheap public transport, and overall fares will rise. As fares rise, the pressure on long-distance low-income commuters will increase. Besides, not all low-income commuters are made welcome on “world class” systems like BRT and Metro — just watch the behaviour of security staff at the Metro entry checkpoints for proof of this, and compare bus and Metro commuters over the same routes. More options is not a bad thing, but in Delhi, and in non-equal Indian society in general, more options allows the classes to segregate themselves by income and appearance. Since those options include a disproportionate dedication to the car and Metro user, who is disproportionately middle- or upper-middle-class, the result is not more social encounters between the classes but less. The lesson? Government can spend on the best, most up-to-date mass transport facilities, but when there is no equality in thought or deed, and even the battles over public space are fought by unequal forces — well, then, the consequences are obvious even if unintended: more of the same. What was the first thing you ever bought online? An IRCTC Indian Railways ticket? Domestic flight ticket? Movie ticket? A couple of years later did you, like the rest of us, graduate to books, CDs, DVDs, cellphones and computer peripherals? And what was your most recent online purchase? Pen? Streaming movie? Vitamin pills? Face cream? Packet of biscuits? T-shirt? Toothbrush? Shoes? You see the change. Once upon a time Indians bought only “virtual” products like movie and travel tickets online. Anything real, and we preferred to go see it in the real world, to sample it with our own senses before paying for it. Now, however, there is a boom in ecommerce, with sales rising very fast, to about Rs 2,000 crore last year from virtually nothing five years ago. Yes, rising incomes and better broadband penetration help but so, most promisingly, do Net-enabled smart phones. There are dozens of new companies and they are making lots of money (and raising lots of venture capital) selling things we Indians only a year ago wouldn’t have dreamt of buying online: clothes, for example, and shoes. How can you buy such things without trying them on? But now we do. We also have begun to buy soaps and toothpastes, sodas and cartons of milk — everything, in fact, on the typical household grocery list, except fresh vegetables and fruit which are difficult to transport and store. To keep us consumers supplied with these everyday things, ecommerce companies are pioneering new ways of doing business, learning to focus fiercely on the back end, from efficient warehousing and shipping to convenient cash-on-delivery. Most of these companies are inserting themselves into the supply chain between manufacturer and consumer, typically elbowing aside the traditional wholesalers, transporters and retailers who shift goods out into the market. In this way they try to capture the maximum share of the purchase price. This allows them to offer discounts to tempt buyers. But some companies are looking beyond merely a share of the purchase price. Ecommerce volumes may be rising, but they are still quite small, and retail margins are just a few percentage points — so the money is not yet cascading in. What is the solution? Well, if you’re not selling much of the product, sell information. This information can be incredibly valuable. Take for example a shopper who is browsing for bath soap. If later he also looks on the same site for a children’s school bag — well, this means he is a householder, time to hit him with offers for the full range of household products. There’s more. Brands usually know in very good detail how many items of what product sold in what outlet in what location. What they do not know is anything about specific customers. An ecommerce site can track its customers browsing habits and the path they take through the site in complete detail. So the ecommerce company can tell a brand, say, that a certain number of women of a certain age in a certain locality bought a certain hair colour three months ago but have not bought it since. And the site can find ways to cluster products or present deals that maximise the chance of the consumer picking them up. Vijay Singh, co-founder of grocery ecommerce startup AaramShop.com — which sells through kirana stores and therefore earns nothing on sales transactions, and pays nothing for warehousing, but makes money on “analytics” — told me, for example, that honey sells when grouped with milk, that when a customer browses one hair colour brand then another hair colour brand might want its ad seen on the same page. And so on. Please don’t imagine that you are anonymous online. Every seeing or buying decision, every link you follow, down to how long you spend on an item, all contribute to an electronic portrait that is more detailed than you could imagine — one that allows companies to know your habits better than you do. Since electronic privacy is not an issue in India — who ever makes a fuss about it? — this personal information is available for sale and use. This is an important issue that we are simply not bothering about. It’s already too late to claw back lost ground. However, more immediately, expect the clever analytics of ecommerce to radically reshape the way real-world business does, well, business. Department stores may find it harder and harder to compete with and match the range of ecommerce sites, but they will fight back with lessons learnt from ecommerce — such as, at the very simplest level, putting the honey next to the milk. Genuine freedom of consumer choice, which has, counterintuitively, not grown but shrunk in recent years, is going. You will no longer be able to choose whether or not to buy, only what you will buy — and the marketers are working to eliminate even that unpredictability. On the one hand this is fascinating and creative work. On the other, it is chilling. Much fuss is being made of late in the West over news that Amazon.com has gone into publishing. It has already brought out a handful of books. By turning into a publisher, not just a retailer, Amazon.com is bridging a gap in the books trade that has for the last century or more been filled with middlemen — agent, publisher, distributor. This means that Amazon.com can now stand alone between author and reader. Because it gets so much consumer traffic, which it can analyse, Amazon.com can claim to know what readers want, and give it to them. Unlike any other publisher in the world, this company has direct access to tens of millions of consumers. So, publishers are very worried. As it is, Amazon.com’s market muscle has allowed it to demand deep retailer discounts from publishers. Now it will compete with them on their own turf. It can offer its authors a degree of access to their readers that no traditional publisher can. So much for ink-and-paper books. What about e-books? Well, there, too, Amazon.com has been leveraging the popularity of its Kindle products and its role as the prime retailer for books to set its own terms. From price to format, Amazon.com has had more or less the last word. Is the e-books market, too, now all zipped up? Don’t count on it. E-books, because they are “e”, can be produced and sold by anyone anywhere on the Internet. Nobody has to pay to have them printed, bound, shipped, stocked, displayed… This is Amazon.com’s Achilles heel. Right now it may be a matter of habit and convenience that a book-buyer in an Amazon-served market will automatically look for any book, even an e-book, on Amazon.com — just as one uses Google to search, without really thinking about it. Traditional publishers, who know that Amazon.com is where the customers are, will sell e-book versions of their titles only through Amazon.com. Suppose, however, that there was a really good e-books search engine, one as effective at finding e-books as Google is at finding results. A search engine that could look into publishers’ sites, university press websites, newspaper sites, individuals’ sites, library systems’ websites, historical archives, memory sites, and so on — just about anywhere that an e-book is to be found — and then give you the results simply. Well, then, you would be able to find the e-book you wanted, howsoever obscure, without recourse to Amazon.com. You could buy an e-book direct from a publisher, who might want to sell it for less than the $10 or so that Amazon.com charges, or direct from an author’s website, say, for $6. Or you could pay for time-limited access to an e-book via whatever library system you have access to (in India, that’s many years away yet). What’s more, you would not need to be trapped by the hardware you use. No more only-Kindle-readable e-books, for example. No doubt someone’s working on such a search engine right now. No doubt it will be tricky to set up and administer. There are many e-books search engines already, but none so comprehensive. A really good one will genuinely liberalise the way e-books move. So much for the supposed dominance of Amazon.com in the future of books. If I can sell a book that I have written, as an e-book off my personal site, via a search engine that can bring my book to the notice of potentially hundreds of millions of users, then who needs Amazon.com? Not that the big traditional publishers should feel much reassured by this. Their costly skills, of shaping, selection, production, marketing, nurturing authors, building a backlist, acting as nodes in an ongoing civilisational conversation — none of which they now do very well — are difficult to protect in such a profit- and growth-focused economic environment. Unless, and this is interesting, the big global publishers reverse their direction of the last three decades and decentralise into loose confederations of small imprints, each with a clear mandate and a certain kind of reading market. Smaller is safer, on the whole, and, with a clear editorial mandate and no deep pockets for massive and speculative author advances, profits will be small but steady. Hopefully, there will also be more choice for the discerning reader than there is today. The future may look a bit like the past. And that’s good news. A friend visiting from Singapore told me a story from real life that sounds to me like far-out escapist fiction. Here it is. One morning a few days after she — let’s call her Shobha — landed in this comically tiny island capitalist paradise, the washing machine in her house stopped working. Being Indian, Shobha girded her loins as she called the maintenance line, expecting the usual tussle with customer service. “Are you home?” said the man on the line. “Yes,” said Shobha, “but in half an hour I have to go to work.” “No problem, I’ll come now.” And he was there in eight minutes. Maintenance Man checked the machine quickly and carefully, decided it would have to be changed, and phoned an associate. Fifteen minutes later the new machine had been delivered, installed, checked and explained, and the malfunctioning one taken away. A brief thank-you not involving cash, and Maintenance Man and his crew were gone. Shobha left home on time, but mildly discombobulated at the ease and pace of service. I was gritting my teeth and thinking of lucky Shobha as my own family in Delhi struggled with the AC company that made and is supposed to maintain our home ACs, and its idiotic, rude and venal employees. At different times, this split unit has leaked, rattled, banged, stunk, disagreed with its own remote control and, most recently, the rotating fan on its indoor unit has fallen off. (Really.) Like a fool I allowed the repairmen, who arrived days later and at the wrong time, to take away the old fan to compare for a new part — and now it’s gone and the company claims nobody took any part and that anyway spare parts are no longer made for that AC, which was bought only in 2005. Yuck! But Shobha, having lived now in Singapore for a while, has become pessimistic about the many conveniences of living in that authoritarian nation-state. New flats, she tells me, are often built without kitchens — because eating out is so cheap, wholesome and easy. Public transport is ridiculously easy — though to board a bus you must have exact change, as no change will be given you. The weather hardly ever changes — it is always warm and sweaty — but when there is rain then the TV and radio airwaves come alive not with monsoonal thrill but with complaints from Singaporeans about interrupted shopping. Are they mad? Is all that convenience and cleanliness and rule-following mentally juvenilising? Poor Singaporeans. They will need their unusually far-sighted and cynically ruthless leaders, because those leaders haven’t left them anything real to complain about. Singaporeans’ political instincts must have gone totally blunt. Lucky us in India. Here, things are either terribly imperfect or lavishly paid for. So our political senses are in rude health. Our stupid rulers haven’t yet realised that the less their citizens have to complain about, the safer and more indispensable they can make themselves. With one exception: the rulers of the city-state of Delhi, who are slowly, slowly, doing a Singapore on their middle-class citizens. No wonder Sheila Dikshit has the safest chief ministerial seat in the country. Wouldn’t you like to know where the rich and famous live? Of course you would. You probably already do. Central Delhi is for the rich and powerful and their servants and servitors. When you drive down Aurangzeb Road or Amrita Sher-Gil Marg a certain amount of rubbernecking is allowed. Who wouldn’t want a spacious, low-slung home surrounded by lawns and old trees? When you drive down Mehrauli-Gurgaon Road between Delhi and Gurgaon you know that on either side are the farmhouses of the seriously rich. When you drive along Outer Ring Road past Panchsheel Park you know that these are the expensive town houses of the farmhouse owners. In Mumbai, everyone knows that Malabar Hill is where the rich once had their bungalows. Now Malabar Hill bristles with ugly skyscrapers filled with expensive apartments. There is also Altamount Road, bits of Colaba, Worli and Bandra seaface — which is a pleasant stretch to motorbike along, and dotted with big old bungalows which belong to old names (and Shah Rukh Khan). And so on. The rich in Hyderabad inhabit Banjara and Jubilee Hills. In Chennai they own Alwarpet, home to J Jayalalithaa. In Kolkata they are to be found in Ballygunge and Alipore. There’s plenty of fascination about the rich — what cars they buy, where they travel, what brands they wear, what art they own, what they do to keep fit, where they eat, what businesses they set up for their children… But nobody seems to have cashed in on this normal and near-universal curiosity so far as real estate goes. Recently on an American academic urban studies mailing list to which I subscribe, there was a flurry of e-mails about tourism focused on wealthy neighbourhoods. Someone mentioned that the US Library of Congress has “star maps” of Hollywood dating from the 1930s — that is, tourist maps which show not the obvious civic sights of the city but the locations of movie-star homes. A little later such brochures came with photos of stars standing outside their homes. There are still such tours, many of them, now that there are so many stars in LA. In Chicago, another listmember pointed out, there are tours of neighbourhoods with houses designed by a famous American architect of the first half of the 20th century, Frank Lloyd Wright. In season, some of the owners open their homes to ticketed tours, and make money. In America there are also tours of areas that were once poor or working class and are now becoming rich, or “gentrifying”. In St Louis, Missouri, a fourth listmember said, such a tour takes visitors through a once-elite area that fell on hard times and is now gradually being restored and gentrified. In Mumbai, as is well known, there is now slum tourism. But the Mumbai slums are full of successful businesses and businesspeople; there’s a great deal of money and commerce there, so they hardly need gentrifying. In any case, few Indian tourists will pay to see slums. Ah, it sounds like fun. I would take the tour. But things would probably change fast on the other side of the road. As yet another urban studies listmember wrote, “Today’s tours of the stars’ homes are disappointing circuits of tall hedges, security gates and misinformation from the tour guides.” If ever a High Roller Tour got under way, I’m sure Lutyens’ avenues would quickly look even more lifeless than they do today, with tall, blank walls and gates to deter the curious citizen. Delhi used to be the car capital of India. Long years ago it was said in wondering tones that there were 2 million automobiles in the city (”automobiles” includes scooters and motorcycles). Life in Delhi, it was said, was a pain without one’s own transport, a pain without an AC in your car. The streets of Delhi, it was said, were a driver’s dream, wide and straight and well paved. Carmakers sold by the thousand, and government helped by keeping taxes and petrol prices lower than elsewhere in the country. All this is still more or less true, though the numbers have zoomed. Delhi is still the largest car market in the country, has the highest density of cars per capita, and the largest total number of automobiles on its roads — more than 11.2 million, according to recently reported figures. So why do I write that Delhi “used to be” the car capital? Because I’ve just spent some time in Mumbai. In Delhi, roads are widened and flyovers added, and somehow utter rush hour traffic disaster is kept at bay. In Mumbai, on the other hand, daytime driving has become terminally sclerotic. A few heroically long flyovers are being added, a coastal road being planned to waft traffic directly into town from the eastern suburbs and Navi Mumbai, a monorail being built to relieve the pressure on suburban trains and roads alike — but even so nobody in their right mind will choose to drive themselves around in Mumbai during the day. Yet there’s something about Mumbaikars’ relationship with their cars that strikes me as far more open-minded and optimistic than that of Delhiites with theirs. It’s not just that small cars are also OK and lovingly cared for in Mumbai; nor that the still solid middle-classness of the city means that a car-owner won’t feel socially superior to their mechanic/repairman to a damaging degree; nor that Mumbaikars love to take family trips out of town on the weekends (to beach/hills/temple) and therefore make the car more wholly a “lifestyle” product. It is also that Mumbaikars seem to be much more willing to try out new car models. I take it as a proof of Mumbai’s open and bindaas spirit that, at an exit from the massive, busy slum of Shivaji Nagar one can see at a crossing four generations of Fiat cars, at the same moment. Or, in the less frequented warehouse district along the Harbour line near Cotton Green, at one little crossing three Skoda Superbs heading in three different directions. Or, on any road anywhere in the city, literally dozens of Mahindra Renault Logans, Hyundai Getzes, Fiat Lineas and Puntos and Mahindra Xylos, even a small smattering of Tata Arias. These are all cars that have not done well in the market as a whole, and that are more or less invisible on Delhi’s roads. But Mumbai has taken to them with no trouble, no timidity about service network and resale value. And they look well cared for. Delhi is full of the bestselling models of Maruti Suzuki, full of Tata Indicas, Honda Citys and Hyundai Santros. The colours here are brown, white and grey, with (now) rare flashes of Punjabi yellow or pink. In Mumbai, on the other hand, you will see many, many reds and even, far more often than a Delhiite might expect, bright blues and greens. Now that is a car culture. Where the car isn’t just a convenience or a status marker, but also something to take simple pleasure in and for the family to enjoy on regular outstation trips; not primarily an investment, but a thing that allows you to give yourself satisfaction. I don’t think it’s a coincidence that most automobile journalists and magazines, not excluding Business Standard Motoring, are based in Mumbai, not Delhi. In my home live three humans, and perhaps two dozen other kinds of creatures visible to the unaided human eye. As I read late into the night, the bedroom window, with yellow light spilling through the net, is the site of a spectacular drama. Different insects are drawn to the light depending on the season: the little flying annoyances which float in from Haryana (so I read somewhere) after the rains, nasty little black biting things the size of mustard seeds, and a variety of moths. So along comes a lizard. Every night he (or she, I wonder?) takes up a position at the centre of the jali and waits for a tasty buzz. Every night he eats so much that I can see his tummy distended and filled up with black. Insatiable! Sometimes this lizard will slap tail or chin against the net to shake loose some bug, and then grab it, or will rush around to pick up mouthfuls from elsewhere in the buffet. My lizard’s favourite is moths. They make him reckless. To get a moth he will leap off the net and land splat on wall or floor a good five feet away or more, to grab it before it flutters away. And woe betide any other lizard who seeks to challenge him for his territory. He stomps and bangs the window, and makes aggressive rushes towards the interloper. He hasn’t lost his perch yet. But the window is a big, sliding one, so inevitably some of the buzzers and flappers slip in between the panels. On its way to the light a little flying annoyance might land on my finger, and then it will perch awhile before taking off with one hell of a kick. Their legs must be among the strongest of all species, given the power to weight ratio. Then they rush toward the light — a bright fluorescent bulb — dance around it for a while, keel over in a dead faint and drift to the floor under my shoe shelf. Over there, throughout 2009, lived a lovely little black lizard, very skinny and shy, who would poke his nose out to see whether I was watching, and (when he thought I wasn’t) dash over to collect his prize. I was delighted with this chap. This year he’s gone. In the morning, if I wake up earlier than normal and visit the toilet, I expect ants. Near the WC is an imperfectly sealed crack which leads to the shaft. Through it dash, in small numbers like scouts, tiny black ants who scurry around looking for food or a shortcut between shaft and doorjamb, or shaft and floor drain. Regretfully I kill them, because I don’t want them making free with my beloved bathroom, but they really are quite likeable creatures — businesslike, not warlike. I don’t think they have soldier variants, because I’ve never been bitten. When they come across the wreckage of one of their comrades, they put on a tremendous burst of speed and zigzag around the floor nearby. I wonder: is this because they’re busy releasing some panic pheromone, or because it’s harder to get killed if they dodge and weave? However: my slippers are large enough to get them. Another bathroom creature: a mysterious but common little grey-brown fuzzy fly-like insect that lives around the bathroom sink. It obviously loves the damp, because it seems to be waterproof. It has a nicely incidental way of flying, nothing like the sly mosquito. One morning I drove to office, and as I was getting out of the car — which had been parked in our damp and dusty basement during the night — I noticed a spider cocoon just hatching on the passenger seat. It was one of the most beautiful sights I have ever seen: dozens of minuscule orange baby spiders, each floating at the end of a single filament of spider silk, a parachute. I left the window open a crack and pushed off happily. In the evening they were all gone. Large, leggy and hairy spiders are a little threatening, but small ones are entertaining. If I’m lucky one day, a garden spider finds its way into our second-floor flat. They are beautiful compact little beasts with neat short legs, a striped back, and a habit of moving in short leaps. Tickly and cute. We have lots of books, which we protect with neem leaves dried and pressed between the pages. But one cannot escape silverfish. In Dalhousie this August I shared my musty bed with big juicy silverfish — ours, thankfully, look leaner, dustier and hungrier, and live mostly among our old files and papers. I’d rather they chewed on our old income-tax files than the books. No wonder they look ill-fed. Birds! The sparrows who lived beneath my window AC vanished two years ago, with every one of their fellows. Even the crows, such characterful individuals, are fewer. The kites look shabbier. The noisy yelling babblers visit only occasionally, like distant relatives. A woodpecker periodically harasses the palm tree outside my window, but I haven’t seen him for a while. Only the pigeons manage, though even they no longer look sleek. What is happening? The dogs in the lane behind used to howl companionably at 1.30 am. It was a chorus, stretching for several streets. After the dogs came the cats, yowling competitively at about 2.30 am along the back wall. Now both those schedules have been thrown off. Sometimes the dogs howl at 2.30 and the cats don’t sing at all. Is it because the little trash dump behind is cleared more often, and by trucks? Like Delhi’s weather our animal environment is also changing in strange ways. Inside the house, where conditions stay roughly the same, wildlife flourishes. Outdoors, it’s all a mess. What will happen in five years? Will we have more and more creatures wanting to join us indoors, and fewer and fewer to lift our hearts outside? At least the “pest”-control companies can look forward to new customers. It’s all very worrying.